Merry Christmas... Forever! This holiday season, forget sending out those boring old regular Christmas cards and send out these cool new, er, utterly sinister Never-Ending Musical Christmas Cards instead. 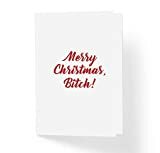 Once a victim, like a family member, loved one, friend, or boss, opens this seemingly normal Christmas card and presses the button, it begins to play an overly merry stream of holiday jingles... for over 3 solid hours... with no way to shut it off. If they try to press the button to turn it off, it only gets louder and if they try to rip it open to yank the wires, it spills glitter out everywhere. Thankfully, it has a safe mode, so you can sign and test the card without pranking yourself. Best of all, you will probably be banned from having to send out cards again next year or possibly ever again, which sounds good to me.